The word kawaii originally derives from the phrase 顔映し kao hayushi, which literally means "(one's) face (is) aglow," commonly used to refer to flushing or blushing of the face. The second morpheme is cognate with -bayu in mabayui (眩い, 目映い, or 目映ゆい) "dazzling, glaring, blinding, too bright; dazzlingly beautiful" (ma- is from 目 me "eye") and -hayu in omohayui (面映い or 面映ゆい) "embarrassed/embarrassing, awkward, feeling self-conscious/making one feel self-conscious" (omo- is from 面 omo, an archaic word for "face, looks, features; surface; image, semblance, vestige"). Over time, the meaning changed into the modern meaning of "cute", and the pronunciation changed to かわゆい kawayui and then to the modern かわいい kawaii. It is most commonly written in hiragana, かわいい, but the ateji, 可愛い, has also been appended. The kanji in the ateji literally translates to "able to love/be loved, can/may love, lovable." The original definition of kawaii came from Lady Murasaki's The Tale of Genji, where it referred to pitiable qualities. During the Shogunate period under the ideology of neo-Confucianism, women came to be included under the term kawaii as the perception of women being animalistic was replaced with the conception of women as docile. However, the earlier meaning survives in the modern Standard Japanese adjectival noun かわいそう kawaisō (often written with ateji as 可哀相 or 可哀想) "piteous, pitiable, arousing compassion, poor, sad, sorry" (etymologically from 顔映様 "face / projecting, reflecting, or transmitting light, flushing, blushing / seeming, appearance"). Forms of kawaii and its derivatives kawaisō and kawairashii (with the suffix -rashii "-like, -ly") are used in modern dialects to mean "embarrassing/embarrassed, shameful/ashamed" or "good, nice, fine, excellent, superb, splendid, admirable" in addition to the standard meanings of "adorable" and "pitiable." Because of this growing trend, companies such as Sanrio came out with merchandise like Hello Kitty. Hello Kitty was an immediate success and the obsession with cute continued to progress in other areas as well. More recently, Sanrio has released kawaii characters with deeper personalities that appeal to an older audience, such as Gudetama and Aggretsuko. These characters have enjoyed strong popularity as fans are drawn to their unique quirks in addition to their cute aesthetics. The 1980s also saw the rise of cute idols, such as Seiko Matsuda, who is largely credited with popularizing the trend. Women began to emulate Seiko Matsuda and her cute fashion style and mannerisms, which emphasized the helplessness and innocence of young girls. The market for cute merchandise in Japan used to be driven by Japanese girls between 15 and 18 years old. No longer limited to teenagers, the spread of making things as cute as possible, even common household items, is embraced by people of all ages. Japanese pop stars and actors often have longer hair, such as Takuya Kimura of SMAP. Men are also noted as often aspiring to a neotenic look. While it doesn't quite fit the exact specifications of what cuteness means for females, men are certainly influenced by the same societal mores - to be attractive in a specific sort of way that the society finds acceptable. In this way both Japanese men and women conform to the expectations of Kawaii in some way or another. The Japan Post "Yū-Pack" mascot is a stylized mailbox;  they also use other cute mascot characters to promote their various services (among them the Postal Savings Bank) and have used many such on postage stamps. 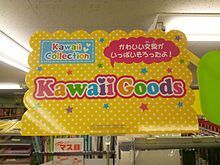 Japanese kawaii seemingly operates as a center of global popularity due to its association with making cultural productions and consumer products "cute". This mindset pursues a global market,  giving rise to numerous applications and interpretations in other cultures. The dissemination of Japanese youth fashion and "kawaii culture" is usually associated with the Western society and trends set by designers borrowed or taken from Japan. With the emergence of China, South Korea and Singapore as economic centers in Asia, the Kawaii merchandise and product popularity has shifted back to the East. In these Asian markets, the kawaii concept takes on various forms and different types of presentation depending on the target audience. ^ " kawaii", Oxford Dictionaries Online. ^ Diana Lee, " Inside Look at Japanese Cute Culture" (September 1, 2005). ^ See "Archived copy". Archived from the original on 2010-11-24. Retrieved 2009-02-12. CS1 maint: Archived copy as title ( link) URL accessed February 11, 2009. Nittono, Hiroshi; Fukushima, Michiko; Yano, Akihiro; Moriya, Hiroki (September 2012). "The power of kawaii: viewing cute images promotes a careful behavior and narrows attentional focus". PLOS ONE. 7 (9): e46362. doi: 10.1371/journal.pone.0046362. PMC 3458879. PMID 23050022. Asano-Cavanagh, Yuko (October 2014). "Linguistic manifestation of gender reinforcement through the use of the Japanese term kawaii". Gender and Language. 8 (3): 341–359. doi: 10.1558/genl.v8i3.341.